Have you ever thought about joining a C.S.A. (community supported agriculture)? Now is the time. For this upcoming season, I’ve teamed up with Lazy Eight Stock Farm. Many of the Ingredients from my weekly CSA share will be built into the meal plans. Lazy Eight Stock Farm’s produce is certified organic – how great is that!?! It’s not to late to join – check them out here. If you’ve never tried chocolate pudding with an avocado base, you aren’t living! The avocado is undetectable – promise. However, the incredibly smooth, creamy, and down right delicious chocolate and banana flavor is unmistakable. In case you’ve been hiding under a rock, avocados are good for you – packed with tons of nutrients and healthy fat. 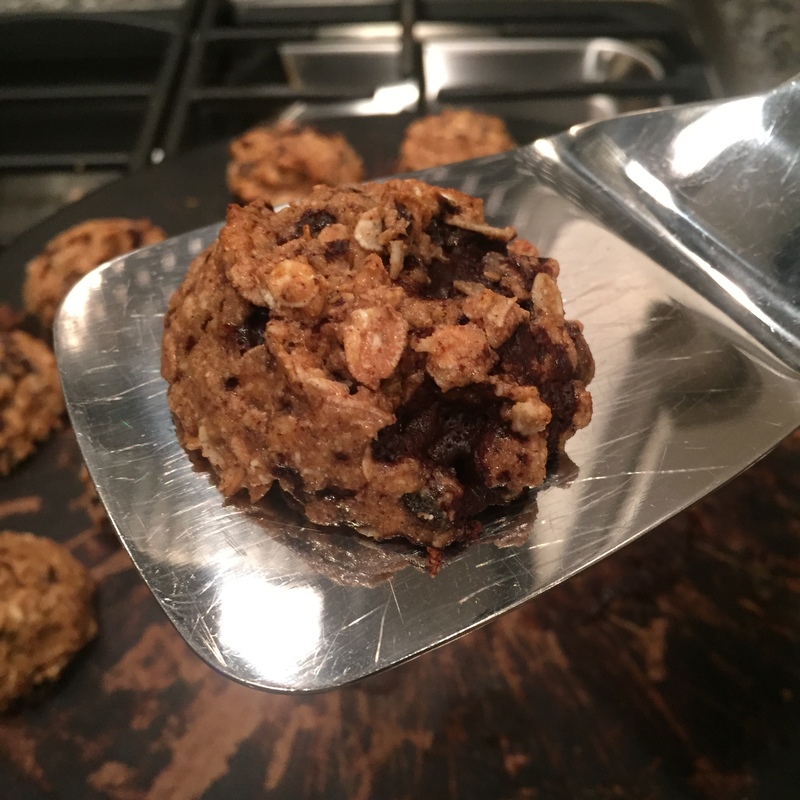 The other snack is a salted chocolate oatmeal raisin cookie! Good quality dark chocolate, honey, and sea salt make these soooo good. Get used to seeing these on weeatforreal.com. They are staples for us. 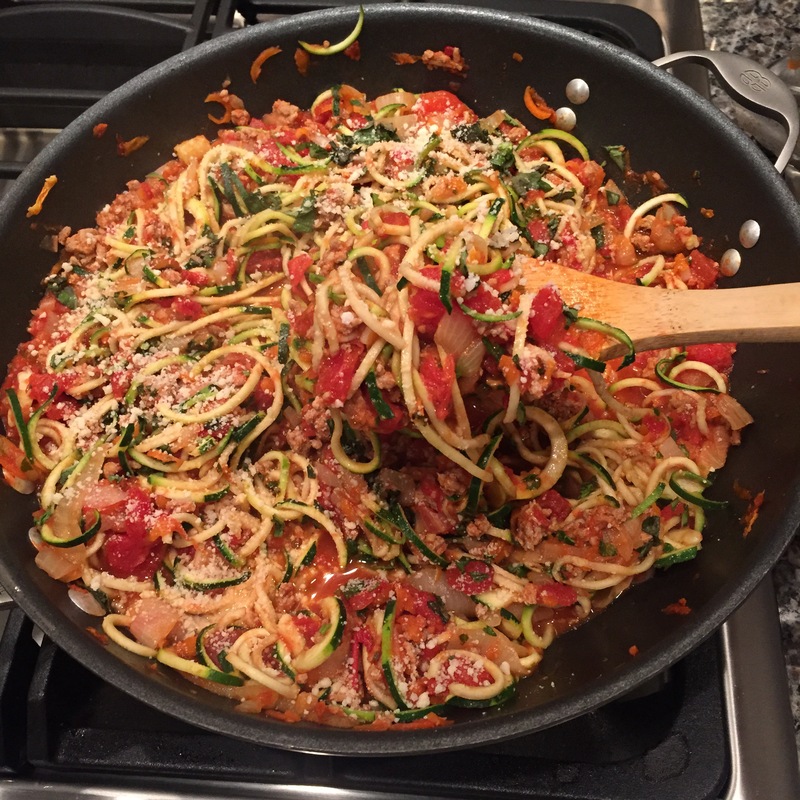 The zoodle recipe is another one you’ve gotta try. You’ll need a Spiralizer or Zoodler to make the zucchini noodles (aka zoodles). This fascinating gadget used to be a bit difficult to find. These days, you can find them just about anywhere – Kroger, Walmart, Target… The Spiralizer also has tons of other uses like apple chips, easy coleslaw, and shoestring sweet potatoes to name a few! 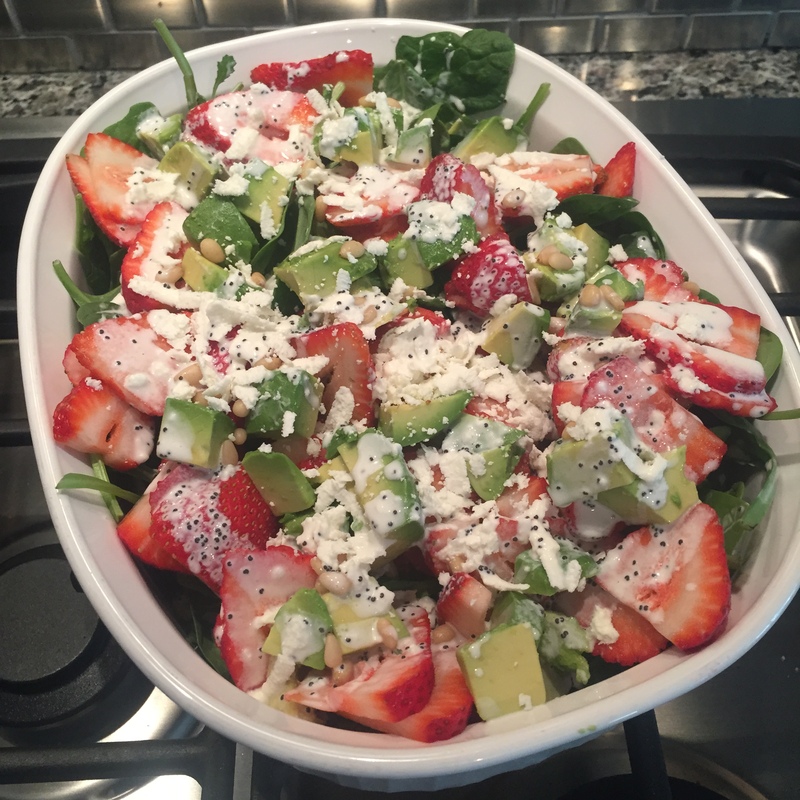 The last dish you should definitely add to your repertoire is the Creamy Poppy Seed Strawberry & Avocado Spinach Salad. The creaminess from the avocados and the tangy dressing go together beautifully. Serve it with grilled chicken and dinner is ready in no time! Take delicious to decadence by adding 1 tablespoon of creamy almond butter (or other nut butter) to individual servings. Trust me, it’s lose your mind good! Directions: Heat a large, non-stick skillet to medium heat. Add olive oil, onion, and sea salt. Cook until softened (about 5 minutes). Add garlic and cook until fragrant (about 1 minute). Immediately add the remaining ingredients and stir. Bring to a boil and then reduce to a simmer. Stir one more time before adding a lid/cover. Every 5 minutes, remove lid and stir. Cook for 12 to 15 minutes or until pasta is cooked to your desired doneness (is that a word??). Season with salt/pepper to taste. Serve with pan seared chicken sausage. Directions: Warm a nonstick skillet or griddle to low/medium heat. In a medium bowl, thoroughly whisk the eggs, milk, half and half, sea salt, vanilla, and nutmeg. Soak bread for about 30 seconds on each side in the egg mixture. Add a little less than a tablespoon of your preferred nonstick oil or butter to the skillet/griddle. (We like organic butter or organic coconut oil). Allow bread to cook about 3 minutes on each side. Serve topped with pure maple syrup. Tip: Preheat the oven to 200 degrees. Add cooked pieces to the oven to keep warm until all slices are done. Serve with preservative free bacon. Directions: For the dressing, add all ingredients to a jar with a lid and shake! Store in the refrigerator until ready to use. For the salad…well, make a salad by adding all ingredients to a serving bowl. Pour about 1/2 of the dressing over the top and mix. Reserve the remaining dressing for those who like more dressing. We typically have leftover dressing that is stored in the fridge for later use. Serve with grilled or pan seared organic chicken breasts. Directions: Heat skillet or stock pot to medium heat. Add olive oil to coat the bottom of the skillet. Add the red pepper flakes to flavor the oil. Allow to cook for about a minute before adding the turkey. With a wooden spoon, break the turkey into tiny pieces. Season turkey with salt/pepper. Cook until no longer pink (about 7 minutes). Add the onion and carrots. Cook until the vegetables are softened (about 5 minutes), stirring occasionally. Add the garlic and allow it too cook for about a minute (or until really fragrant). Immediately add the tomatoes, oregano, and coconut palm sugar or stevia. Break up the whole tomatoes with the spoon. Bring the sauce to a boil. Reduce to a simmer and allow to cook for 10-15 minutes – uncovered. (This will allow some of the liquid to cook out). Add the zucchini. Use tongs to gently mix the zucchini into the sauce. Allow zucchini to cook until slightly softened (approximately 5 minutes). Stir in the fresh basil and a sprinkling of cheese. Plate and finish with a drizzle of good extra virgin olive oil and a bit more Parmesan cheese.